I’ve long wanted to visit Vienna – a European city break is just my type of holiday. I’m sure I’ll get there one day, but in meantime, what better way to experience the city than through its literature. Vienna Tales is a collection of stories featuring Vienna. This diverse anthology includes pieces by older, established writers such as Arthur Schnitzler (1862-1931), Joseph Roth (1894-1939) and Adalbert Stifter (1805-68), along with works by more contemporary authors, many of whom were new to me. As with other collections I’ve reviewed, I’m not going to try to cover each story in turn. My aim instead is to give a flavour of the themes and a little of what I thought of the anthology as a whole. The stories in Vienna Tales are arranged geographically rather than chronologically, so we roam around the capital from west to east and back again. Several of the pieces are set in the margins of Vienna, reflecting the centre from a distance, but each one seems to capture a different facet of the city. Joseph Roth’s short sketches, Day Out and Merry-go-round, also fall into this category. Several of the pieces in this anthology touch on the mood or atmosphere of the city. In Vienna by Heinrich Laube (1806-84), a man is entering the capital from the south by horse-drawn carriage. As he travels towards his inn in the dawn light, the visitor reflects on his impressions of Vienna. By contrast, we see a different perspective on the city in Dimitré Dinev’s excellent story, Spas Sleeps. This contemporary piece features Spas, a Bulgarian refugee who fled to Vienna at the end of the 20th century in search of a new beginning. At the start of the story, Spas is sleeping on the street, but the vast majority of this tale focuses on the years leading up to this point. Reflecting on the time of his arrival in Vienna in the 1990s, Spas was full of hope and ambition, full of belief in the future. He longed to find work as it represented everything: a means of survival, peace of mind and the only way of staying in the city. We follow Spas and his friend, fellow Bulgarian student, Ilija, as they search for any kind of work, be it temporary manual jobs or something more stable. The two young men share everything, pooling their resources along with the opportunities to work and study. As the years pass, the laws get tighter and tighter making it increasingly hard for them to survive. There are many compromises and sacrifices along the way. This is a very poignant, thought-provoking story, one that remains all too relevant in Europe today. I think it will stay with me for a long time. There are stories by other contemporary writers too. These include: Envy by Eva Menasse (b. 1970) – a subtle story that touches on love, loss and the tensions in a family; and Six-nine-six-six-nine-nine by Doron Rabinovici (b. 1961) – an eerie story of a composer who, when he rents a garret in the Viennese suburbs, hears a mysterious voice on the phone line. Vienna Tales is a really interesting collection, all the more so for the sheer variety of pieces included. I would recommend it to any lover of literature with an interest in the city. The anthology also contains an excellent introduction by the curator, short biographies of each writer and a myriad of suggestions for further reading on Vienna (both fiction and non-fiction). Emma and Marina Sofia have also reviewed this collection, which I read for Caroline and Lizzy’s German Literature Month. 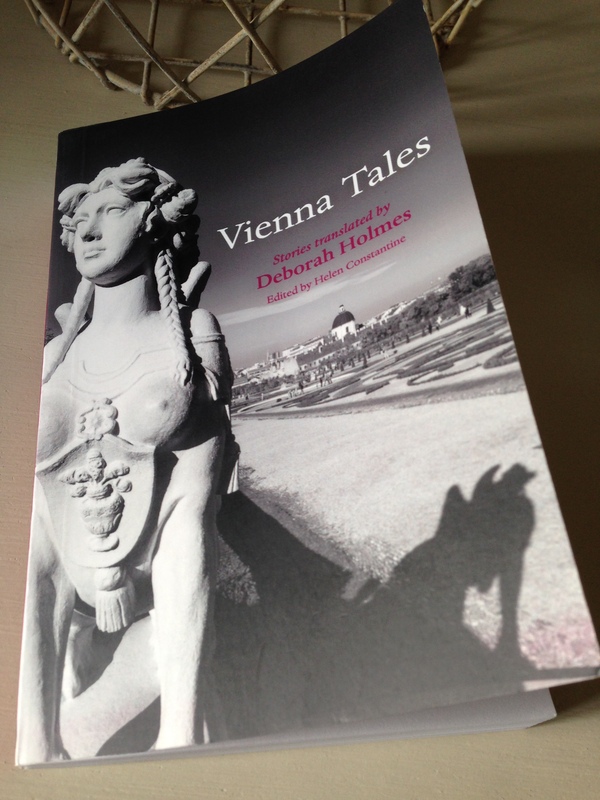 Vienna Tales is published in the UK by Oxford University Press. Source: review copy kindly provided by the publishers. This entry was posted in Book Reviews, Kürnberger Ferdinand, Roth Joseph, Schnitzler Arthur, Stifter Adalbert, Women in Translation and tagged #GermanLitMonth, #TranslationThurs, Adalbert Stifter, Anton Kuh, Arthur Schnitzler, Book Review, Deborah Holmes, Dimitré Dinev, Doron Rabinovici, Eva Menasse, Ferdinand Kürnberger, Fiction, Germany, Heinrich Laube, Joseph Roth, Literature in Translation, Oxford University Press, Short Stories on November 10, 2015 by JacquiWine.